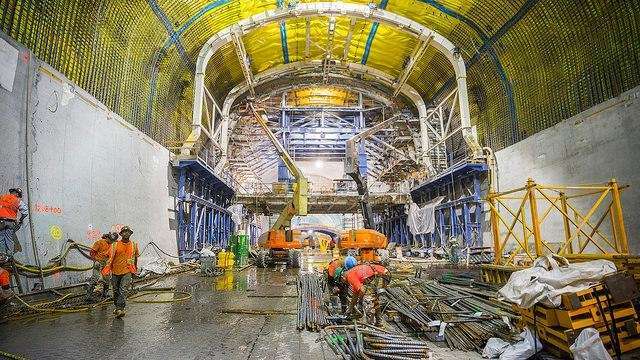 The massive $10 billion project to connect the Long Island Rail Road with Grand Central Terminal is 60% done following nine years of construction, the MTA said Wednesday during the first public tour of the site in two years. Workers have finished tunneling in Manhattan and Queens -- pulverizing 350-million-year-old rock and sending almost a Chrysler Building's worth of muck between the two boroughs on a conveyor belt, which officials said was a logistical nightmare. The eerie caverns underneath Grand Central measure five city blocks long by six stories high. The MTA has done 2,702 blasts there since major construction began in 2006, as well as almost 190 in Queens. The tunnels in Manhattan go up to 140 feet deep. Michael Horodniceanu, the president of capital construction, joked that he hopes he is still alive when LIRR trains go into passenger service at Grand Central in Dec. 2022. The first expansion of the LIRR in a century has been particularly difficult because the MTA does not want the construction work to have any impact on LIRR or Amtrak service. 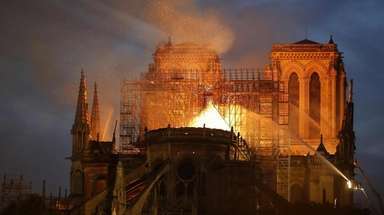 "This is a project of historical proportions that we have never done," he said. "This is incredibly complex." The project will include four platforms, almost 50 escalators and eight tracks. The concourse, under construction now, will be up to 1,360 feet long and up to 15 feet high. Thirty tons of steel are being used to build it, the equivalent of 53 Olympic-size swimming pools worth of concrete, and almost 1,850 people are working on the project. The largest transit project in the U.S. is no longer in financial jeopardy since a $29 billion capital plan funding agreement was reached between the city and state. Called East Side Access, it will get $2.57 billion in funding from the plan. Horodniceanu blamed the project's steep price tag on construction costs in New York, such as using unionized labor, but said it was worth it. "New York is an expensive town, we are paying people well," he said. The project is expected to save LIRR riders who commute in eastern Manhattan up to four hours of commuting time in a week, or 40 minutes a day, by allowing them to go directly from Long Island to Grand Central. "The only way to remain competitive on a world map, like Shanghai or Paris, you need public transport," Horodniceanu said. "The time of moving people in cars is gone; it's passe." When the expansion opens, the MTA will be able to run 24 LIRR trains in Grand Central during a peak hour, as well as 37 at Penn Station. More than 160,000 riders a day will be served by the project and there will be 25,000 feet added for new shops. The rail tunnel underneath the East River will also be able to handle 50% more trains.